I started this site as an extension of the stressed nest. On the stressed nest, I focus on our daily lives and having three kids with special needs. The goal of this site is to share my love of cooking and baking. The two sites may share some overlap we will see how things go. I am by no means ANYWHERE close to being a professional chef but, I have always enjoyed baking and cooking and it has been a nice outlet for me. Having food allergies is very stressful and having control over the food my family and I eat definitely makes my anxiety go way down. 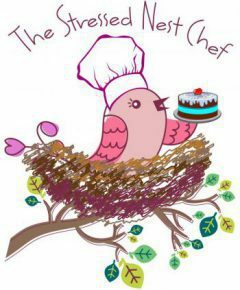 Which is why I decided to start the stressed nest chef. I will share a lot of my cakes and other recipes in hopes of helping others who struggle with food allergies. In our house, we currently avoid all peanuts, tree nuts, and shellfish. We are not dairy free but, we try and limit dairy and use a lot of lactose-free products (not in the cakes, though…) Maybe, I should try a lactose-free cake sometime. Let me know if you or a family member has a food allergy and misses a certain food or recipe due to the allergy. I love modifying a recipe so, we don’t miss out on things!